Are You Ready to Show Your Kids Some Love? 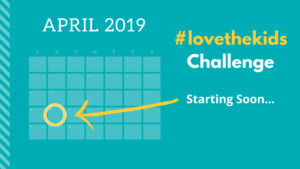 If so, then join us for the FREE 5-day #lovethekids Challenge! During this challenge we will explore ways to change our thoughts, words, and actions in order to show our kids more love…on purpose! Now that spring is finally here, it’s time to start cleaning house…and why not start by getting rid of the old, negative ways that we’ve been dealing with our kids? Planning trips for Spring Break and holiday celebrations are nice, but if you want to do something for your kids that’s REALLY going to make them feel loved, then this is the challenge for you! We’ll be working through some fun, mindset-shifting activities to help you grow as a parent and learn to be more positive and purposeful in your interactions with your kids! The challenge starts on April 22, 2019 and it only lasts for 5 days…but the results that you can get in such a short time will blow your mind! If you’re up for the challenge, just enter your name and email address below to get access to the party! We have a private FB group where we’ll be sharing our daily #lovereceipts, so be sure you request to join the group once you sign up! Ok – let’s show our kids some LOVE!